Suzanne & John Bruns just returned from Las Vegas where they attended Janome Institute, an international conference for Janome Sewing Machine Dealers. At the conference, an new top of the line sewing and embroidery machine was introduced, the Memory Craft 15000. 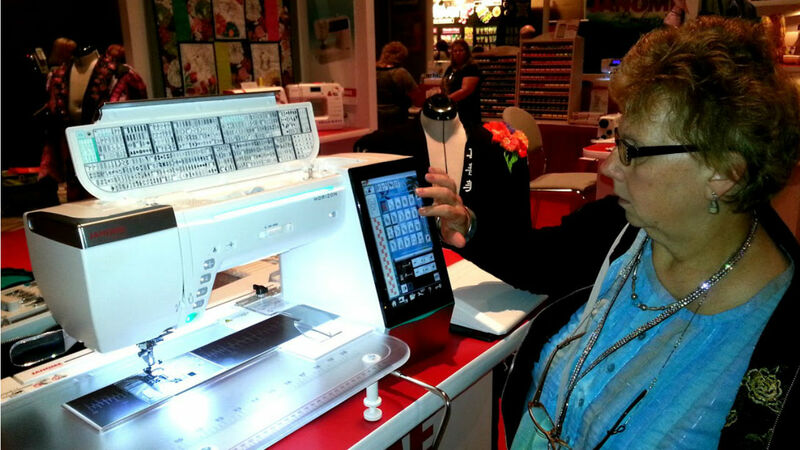 This new machine brings the latest technology to sewing and embroidery as it will work wireless with your computer and also communicates with an Apple Ipad which is included with the purchase of the machine. In addition, the MC15000 has a larger embroidery hoop, ability to do cutwork, largest touch screen on any home sewing machine and hundreds of new built in stitches and embroideries. Prairieland Quilts will be celebrating 20 years of business in Cissna Park this fall and has always been an Authorized Sales and Service Dealer for Janome sewing machines. As a certified MC15000 dealer, Prairieland Quilts is one of very few locations where this and all the other Janome models can be found.